Often on holidays we have limited time to study so the Discover Scuba Diving program is a perfect way to see how it is to blow bubbles underwater and see if being an ”aqua-naut” is for you! After a safety briefing where we will cover all important scuba diving aspects, you will learn a couple of skills in our swimming pool to build up your confidence before you venture out into the ocean. We do the theory and swimming pool sessions in the afternoon so you are fully ready to join our dive trip the following morning. The ultimate part of this program takes place on your ocean dives surrounded by beautiful corals and tropical fish. Discover Scuba Diving is a perfect experience to remember in years to come – or if you want to continue and dive some more, count it towards your PADI Open Water course and get certified! This was our first time diving, ever. We inquired with a few local dive shops about the Discovery Dive possibility. All companies on the island offered a simple one dive in a protected bay (nothing better than what we had previously seen while snorkeling) but Big Fish Diving offered 2 dives away from the bay alongside other certified divers. Our guide ensured we were 100% prepared and safe the entire time. The entire staff was extremely friendly and professional from initial inquiry to our pool intro and dives. 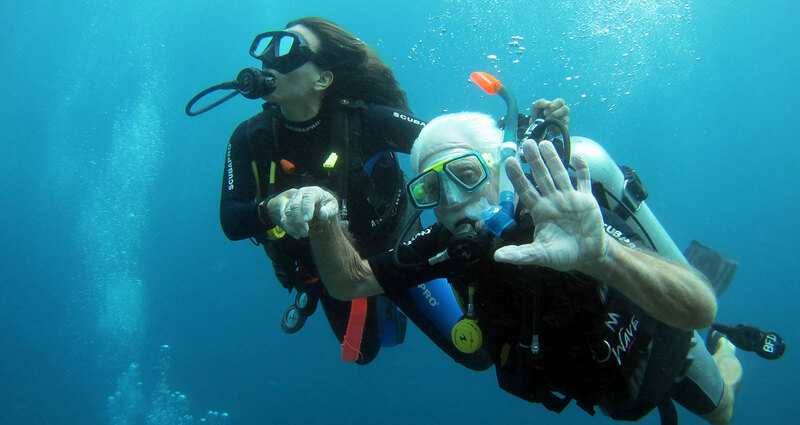 Thanks to their experience that is far better than any other on the island, we will be attending our own Open Water dive certification before our next vacation! If anyone is on the fence about becoming certified and is interested in a discovery dive, this is the place! I recommend Big Fish Diving over all others.